New Jersey Table Tennis Club is located in the heart of beautiful downtown Westfield, New Jersey, USA. We are across the street from the Train Station at 226 North Ave. with ample parking. 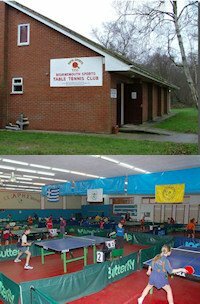 New Jersey Table Tennis Club is one of the best and largest table tennis clubs in the USA and we have over 200 Members. All levels of players of any age are encouraged to join. We have members whose ages range from 7 to 80+ and abilities from beginner up to David Zhuang - 6 Time USA Champion and 3 time Olympian. We have 8 World Class Butterfly Europa 25 table tennis tables (as used at many World and European Table Tennis Championships). We organise 10 Two Star USATT sanctioned table tennis tournaments a year, for all caliber of players. We have excellent coaching for beginners to advanced players - both youth and adults. Low-cost group training programs to help improve play skills and techniques for beginner, intermediate and advanced level players. Our lighting is outstanding with fluorescent lighting over each table for maximum visibility. 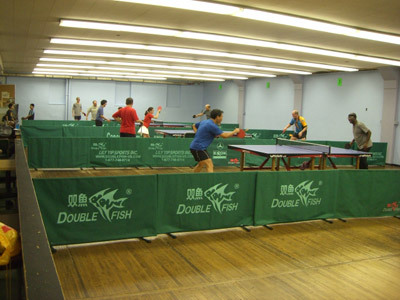 New Jersey Table Tennis Club has solid hardwood floors, which are easy on the legs. The club runs several different leagues throughout the year, including team leagues and a youth league which meets on Saturdays and has some of the top USA Juniors. We are open 365 days a year and staffed by volunteers. M-F, 7pm to 11pm +, weekends vary. Our rates are very reasonable for individuals, youth and families. Full year is as low as $405 for adults, with no hourly table charges.